What to do with leftover cake batter?! I decided on a batch of bite sized mini cupcakes. In the classic cupcake style, with swirls of pink frosting and a marzipan cherry on top. My daughter, who turns two at the end of the month, has a book that features a drawing of a cupcake just like this, one that she likes to grab at with her hands and pretend eat. Which is a little strange, since she has only had one cupcake in her lifetime and that was over a year ago. She seems to naturally know that cupcakes are yummy. She also tries to eat this sail boat on the same page. Anyway, I figured I'd make the littlest Humble a treat from the remaining batter. If you have any leftover cake or brownie batter, feel free to give this a go. I wouldn't attempt this with a full batch of cake batter as it will make well over a hundred cupcakes. I don't know about you, but dealing with that many tiny cupcakes seems a little tedious to me. Using 1 1/3" x 3/4" foil liners set into a mini muffin tin, divide your leftover batter among the cups. Bake at at 350 degrees for roughly 10 minutes and then allow to cool completely. In your mixer beat the sugar, butter, vanilla, cream and a drop of red food coloring until light and fluffy. Add the frosting to a pastry bag fitted with a medium sized round tip (Ateco 12). Tint your marzipan with a drop of red food coloring and kneed to distribute. If it gets sticky add a little powdered sugar to your hands. Roll the marzipan into a half inch thick log and then slice into small even pieces. Roll each into a ball and then roll one side of the cherry along the length of a bamboo skewer to create a little crease in the side of the cherry. Tint the fondant brown in the same manner as the marzipan and then roll out into a very thin length. I used the tip of my skewer to cut each length, stabbed one end of my 'stem' to pick it up and then stabbed it (the stem and my skewer) into the top of my cherry to securely place it. Top each cupcake with a swirl of frosting and top with your marzipan cherries and you're done. My daughter was thrilled by them. These would be great for a child's tea party. They are so darn cute. You are very talented.. This is a great idea, the pictures look so yummy that I think I need to try this. Heh, that's awesome. Aren't kids strange? The cupcakes are stunning, of course. Oh, WOW. They look absolutely delicious. I'm channeling garden party all the way. Came across your blog from blog of note. Your blog is absolutley beautiful! Normally, cooking blogs scare/intimidate me, but this is all so fun, I'm going to stop by frequently. Congrat! It looks so yummy. mmm yummity yum, they look wonderful! This made me so hungry! lol. Congrats on being a Blog of Note! Early in the morning, here in Pakistan and so yummy pictures made me hungry. Congrats! for being a "Blog of Note". Those are ADORABLE! And, btw--I only live a few hours south of Seattle. So much for the rumors of snow...we've been getting rain here for the last 24 hours, which washed away the inch of snow we'd been cherishing for the past week. Lovely blog--well-deserving of Blog of Note! 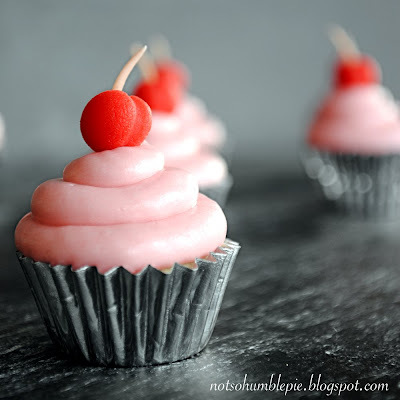 Lovely Blog, and I love the cupcakes with marzipan cherries, what a neat idea! What A very talented woman. You made the pictures as if i'd like to eat 'em..
Sweet pictures. I'm pretty hungry now..
Congratulations on your Blogs of Note. Waves from a Scots Lass living in South Africa. The photos are very, very inviting. I discovered your beautiful baking blog by random on my blog Village de Vaux, which is written from my home in France. Francesca, my only grand daughter, would love to have a Monsieur ou Madame Souris cutter for her 2nd birthday in March as a squeaky mousey gift from Gran'mama. Are there any ladybird cutters as she loves this insect and I have to find her all things ladybird to send through the post! Thanks for letting us snoop into your life. Marcipan cherries (yum!) 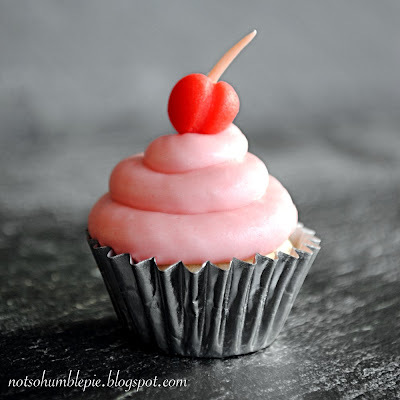 beat maraschino cherries any day... (well, on a cupcake anyway!) adorable! congrats on being a blog of note too. Those look too gorgeous to eat....almost. Who can resist a cupcake? Great for a tea party if you have some way for the kids to run around a while after they eat those cupcakes. Says the dad of a 2.7-year-old who loves chocolate cupcakes.